The Food and Brand Lab from Cornell University did a study about the psychology behind how breakfast cereals are marketed to the consumer. Using data they collected from 65 types of cereal and 86 different spokes-characters in 10 different grocery stores in New York and Connecticut, Director of Cornell's Food and Brand Lab Brian Wansink and post-doctoral lab researcher Aner Tal published their study in the Journal of Environment and Behavior. They note in the study that 16% of the consumers are more likely to trust a cereal brand when the characters on the cereal box look at them straight in the eye. They also note that breakfast cereals targeted toward children sit half as high on the shelves (around 23 inches from the floor) compared to adult cereals (48 inches from the floor). The study reinforced the marketing practice that creating spokes-characters who make eye contact with a product’s target audience (child or adult) is a package design that can be used as an advertising tool that influences people to buy and develop brand loyalty. Director of Cornell's Food and Brand Lab Brian Wansink and post-doctoral lab researcher Aner Tal, are releasing a new study today published in the Journal of Environment and Behavior that discovered consumers are 16 percent more likely to trust a brand of cereal when the characters on the boxes on the supermarket shelves look them straight in the eye. 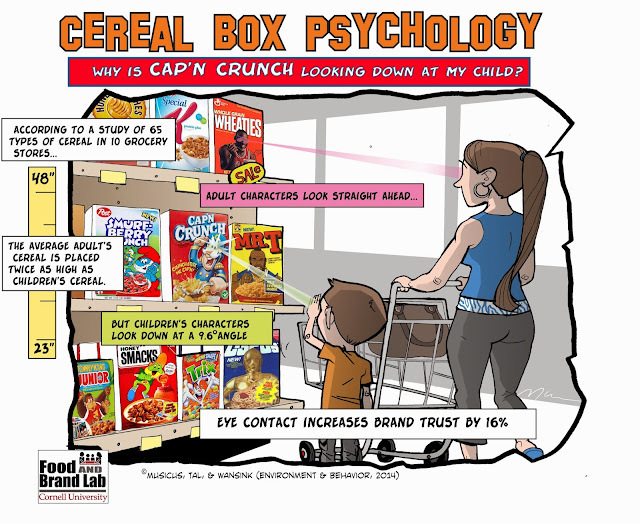 Not surprisingly, the study also found that the gaze of characters on children's cereal boxes is at a downward, 9.6-degree angle, while characters on adult cereal boxes look almost straight ahead. "If you are a parent who does not want your kids to go 'cuckoo for Cocoa Puffs,' avoid taking them down the cereal aisle. If you are a cereal company looking to market healthy cereals to kids, use spokes-characters that make eye contact with children to create brand loyalty." "There are some cool things happening in grocery stores, many based on psychology, that impact how and what people purchase. "By studying more than 80 breakfast spokes-characters, we found that kids' cereals are positioned at the same height as kids ¬– about 23 inches off of the floor and adult's cereals are positioned at about 48 inches off of the floor." Eyes in the Aisles: Why is Cap’n Crunch Looking Down at My Child?